Presidents' Day was Monday and what better time for an 8-foot-tall statue of a shirtless Abraham Lincoln to be making the rounds. On Twitter, @MuseZack rediscovered this gem of a sculpture. Witty names like "Honest Abs" and "The Gettsyburg Undress" are being used to describe it. And @PKtje has dug up "shirtless Lincoln" fanfic. And, yes, it's real. "Young Lincoln" was sculpted in the late thirties by James Lee Hansen (who may or may not be this James Lee Hansen). A year out of art school and frustrated by his lack of success in the real world, a friend prompted him to enter a sculpture competition at the Federal Building. He was interested, however, and checked up—only to find that the contest, under way for several months, closed for the model entries in a week. Hansen got a supply of plaster and made a small figure of Lincoln. Like the other contestants, he submitted it anonymously to the Fine Arts Section of the Federal Works Agency. No one was more surprised than Hansen when he was notified his entry has won $7,200 and a commission to do the Lincoln statue. Within a year it was fashioned from Indiana limestone. The pose shows Lincoln as a young man, wearing only a pair of jeans, with the thumb of one hand hooked in the band of the garment and with a book in the other hand. 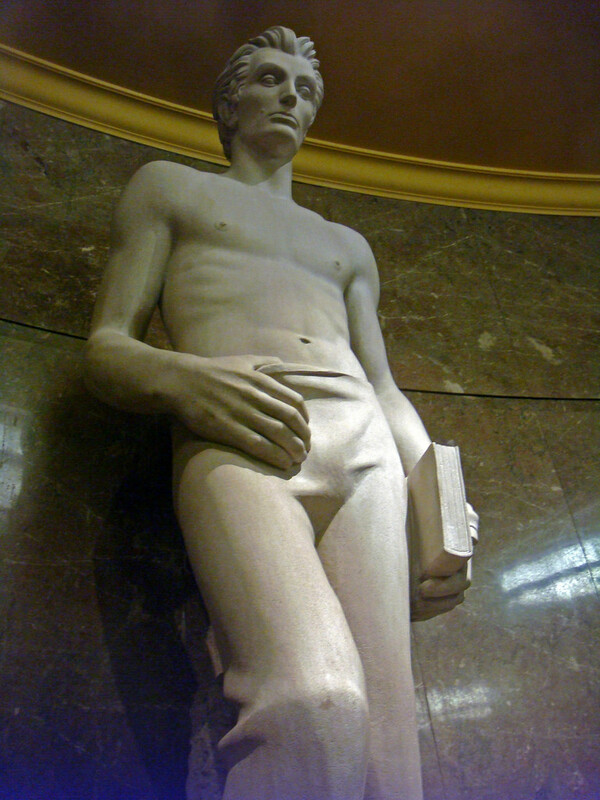 Hansen shrugged off observations to the effect that his job had been criticized because Lincoln is shown without a shirt or shoes. He also left off Lincoln's shoes. The story doesn't end there though. Hansen took that money, bought a car, crashed it, and spent 18 days in jail. Should you wish to visit "Young Lincoln," head to the U.S. Court House on 312 North Spring Street in downtown Los Angeles. Tonight is the launch for my latest book of science fiction for adults, Radicalized: I'll be at the Barnes and Novel at The Grove in Los Angeles, in conversation with director/activist/stuntwoman/champion kickboxer Lexi Alexander, starting at 7PM.